This outlines an old proposal of mine to modify VAT to create jobs. The proposal gives extra flexibility to the management of the economy, making it easier to achieve full employment. 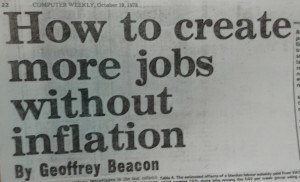 Below are two pieces I had published in the Computer Weekly in 1978. The first is an introduction from something that got rather technical and the second more concise description of the proposal I have been putting forward since the early 1970s. The desire to increase employment without inflation is motivated by the belief that increased leisure cannot be the complete solution to the unemployment problem, which is being brought about by the combination of the limits to growth and improvements in labour productivity. There are two main reasons for this belief. The first is that we live in a work orientated society. For the majority achievement derives substantially from employment. The second reason is that leisure should not be forced on people, either by unemployment or short-time working, who could enjoy shorter periods of leisure a great deal more with the extra income that comes from employment. In his response to the Futureview by Barrie Sherman, John Harris suggests a cure for technological unemployment in the reduction of the cost of labour by providing a “national wage” to supplement incomes and enable people to work for less (letters. March 16). This is a view I have, for some time, thought worthy of further consideration and have studied the available literature and made several personal inquiries of various economists. The result of these inquiries has been disappointing in the sense that I have found hardly any good economic analysis on the subject but encouraging in the sense that there is hope that our main economic problem, the effect of increasing labour productivity on employment, has a fairly simple solution which has not yet been properly considered. For the purposes of enabling a reduction in the cost of labour a “national wage” would have the same effect as a blanket employment subsidy and what literature I have seen has been in such terms. None of the articles. however have considered the effects of raising [expenditure] taxes to pay for the subsidies. It is, of course, not necessary to blance government expenditure with in- creased taxation. but at this stage when so little has been written it is a convenient way of considering the problem. 1. The net eﬂect on prices would be neutral, the increase in prices due to VAT being offset by the decreased cost labour in manufacture. 2. The cost of labour falls as a factor at production relative to other factors. This leads to a fall in the price of labour-intensive goods relative to other goods. The effect is more pronounced for goods made with low paid labour, since the subsidy in this case is proportionally larger. 3. The fall in the price of labour-intensive goods increases the demand for them and thus increases the total demand for labour. 4. The increase in the total demand for labour has most effect for the low paid. Indeed, high-paid labour may suffer a fall in demand as with the other factors in production. 5. These changes in demand would tend to increase the income of the less affluent and decrease the income of the more affluent. As part of an overall system of taxation this system would have many of the advantages of the tax on yearly personal expenditure recently considered the Meade Committee. 6. An increased level of employment would mean a saving on unemployment benefit and so reduce the Public Sector Borrowing Requirement. This would make restrictions on the money supply less painful and the control of inflation easier. 7. VAT is paid on imported goods which would not receive the labour subsidy during their manufacture. This would have a depressing effect on imports. Similarly exports would be encouraged. 8. The level of labour subsidy and the conditions under which it is paid introduce extra degrees of freedom in the means that can be used to control the economy. This would create greater ﬂexibility for attaining policy objectives. Your correspondent expresses the fear that if labour costs were less there would be less incentive for employers to introduce new technology. I remember this view being expressed by at least one of the economists I have contacted. This view, however. accepts a high level of unemployment as the price for progress. Such a view as this can only be justified if it is shown that the real resources lost cannot be used to promote the use of modern technology in a better way. My first suggestion to this end would be government financing of selected computer software to be made available FREE. Software, with its high development costs and its low marginal costs is a classic case of product with increasing returns to scale. Economlc theory recognises that competitive markets cannot operate perfectly with such products. There would he a tremendous beneﬁt from published computer software suitable for copying and modifying to suit particular needs and the lowered cost of basic software would prevent its re-invention many times over and enforce a certain standardisation. Since 1978 most of us have recognised the importance of climate change. It is (or should be) the most important limit to economic activity. I do not wish to argue with those that claim there is no absolute limit but the dangerous state of our climate means that the rate of growth in the foreseeable future must be limited. A reduction in CO2 emissions can be achieved by reducing carbon intensity, the amount of CO2 generated for each $ of economic activity. If carbon intensity cannot be reduced fast enough then economic activity (Gross_World_Product) must be reduced. It is hard to avoid the conclusion that world economic activity must be reduced. To save the climate, it makes sense to reduce the economic activities that pollute the most: such as building with bricks and steel, eating beef, flying in planes and traveling in cars. Car travel is where my proposal. Back in the 1960s, I felt that mass car transport was a mistake: the gain to individuals from the use of their cars was outweighed by the damage to society from pollution and other external costs. People would ask “What are you going to do for the unemployed car workers?”. The VAT-with-rebates proposal was my answer.